Every Pulitzer Prize-winning play had to start somewhere. And in the past three decades, three of them have started at the Humana New Play Festival at Actors Theatre of Louisville. This year’s festival runs through April 6, and the six-play line-up includes Steel Hammer—a performance piece by Anne Bogart’s SITI Company—and The Christians, Lucas Hnath’s new play about a crisis of faith in a megachurch. SITI’s work is always inventive and challenging. And by “inventive and challenging” I mean that the last time I saw this group perform, an actress went through the audience with a microphone, asking individuals about their sexual practices. People pretty much withered in their seats when she approached them. I haven’t seen a play by Lucas Hnath before, but I know about him. A year ago NPR’s Science Friday program did a piece about his play Isaac’s Eye, in which an actor playing Sir Isaac Newton replicated Newton’s experiment of putting a long needle into his eye. It was fascinating, but I couldn’t help but cringe, and I was only listening to it. I can’t imagine what it was like to watch it. 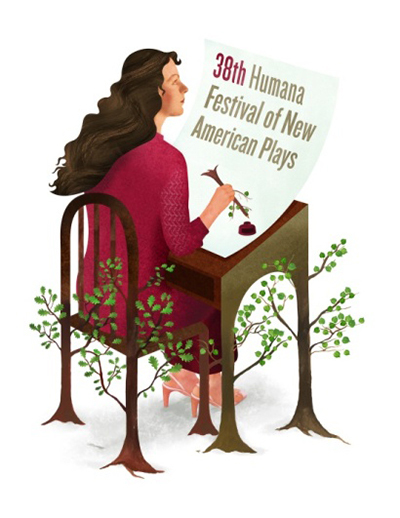 I don’t know know all the details of what Hnath and Bogart are presenting in Louisville, but here’s my wardrobe advice if you’re heading to the Humana Festival: wear something comfortable that you can squirm in.